Podakovania: JISO, vinco, AUDII, KnoXviL_Sk, 11amigo11, sú vdační za túto tému. • Support of all screen readers. • Additional view for main window - classic icons. • Option to write MP3 tags in Audio Grabber. - Additional view for main window - labels. - Feature to select and verify any file in any session (Data Recovery). - Feature to display track CD-Text in Disc Info tool. - New method of write speed detection. - Direct copy mode is enabled by default in Copy Disc tool. - Optimized buffer and memory handling. - Fixed possible bug with disc reading during copying to ISO. - Minor bug with write speed setting. - Codepage support for ANSI translations. - New boot image file (DOS 6.22). - New file sorting method. - Updated disc reading engine (Copy to ISO, Copy Disc). - Improved Span Disc tool and ASPI initialization. - Improved user interface for standard DPI resolution. - Updated icons and translations. - Resolved problem with reading data from boot disc. - Fixed possible bug with adding big files >2 GB. - Fixed bug with file name length in Joliet/ISO compilations. • New disc burning engine in Multiburn tool. • New method of file extraction in Data Recorvery tool. • Feature to check free space on hard drive prior to save ISO. • Optimized data buffering during burning process. • Improvements to user interface and program's performance. • Updated installer and translations. • Fixed bug with arranging data in Span Disc tool. • Resolved problem with hot keys and keyboard support. • Resolved problem with disc erasing in Multiburn tool. • Option to prevent entering sleep mode while disc burning. • Updated and improved main UI theme (Categories view). • Improvements to buffer handling in Multiburn tool. • Improved file extraction process in Data Recorvery tool. • Minor optimizations for high-DPI screens. • Fixed bug with creating new session on single-session disc. • Fixed bug with auto disabling Direct Copy mode in Copy Disc tool. • Resolved problem with burning multiple copies in Copy Disc tool. • Option to prevent entering sleep mode while disc erasing. • Updated and improved "Icons" theme. • Improved extraction of audio tracks in Audio Grabber. • Fixed bug with setting default options. • Fixed bug with loading session if more than 9 sessions on disc. • New "Icons" theme (set as default). • Updated "List" theme and user interface. • Improvements to disc copying tools. • Resolved problem with burning big compilations (more than 200.000 files). • Fixed bug with detection of 50GB and 100GB Blu-ray Discs. • The number of recorders in Multiburn extended to 8. • Additional free space checks before burning ISO image. • Support of Windows dark themes. • Fixed bug with returning to main screen in some tools. • New tool to extract files and folders from ISO images. 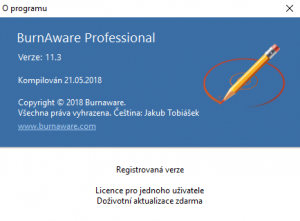 • Option to associate ISO files (.iso) with BurnAware. • Support of HD audio tracks in Audio CD compilation. • Option to use original disc name for new sessions (multisession disc). • Hotkeys for Play and Stop buttons in Audio CD compilation. • Updated translations, themes, help file and installer. • Fixed bug with cancelling disc recording in multidisc compilation. • Fixed bug with keeping value of “Number of copies” option. • Fixed bug with displaying disc label in Data recovery tool. • Option to load PLS playlist using command-line. • Improved Hi-Res audio track conversion in Audio CD compilation. • Improved 64-bit version of shell context menu. • Improved disc copying tool (ISO/BIN verification and log). • Resolved problem with incorrect encoding in translations. • Fixed bug with converting audio tracks with 44.1 kHz and 24/32 bits. • Option to add or remove shell extensions (32 and 64 bits). • New method for loading and processing language files. • Updated help file, translations and shell extensions. • Improved program's overall performance. • Resolved problem with memory leaks in multilingual versions. • Resolved problem with setting STPD on 64-bit systems.